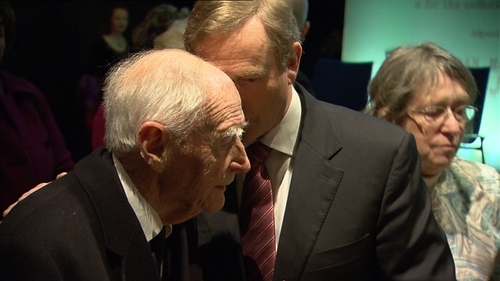 Former taoiseach and Fine Gael leader Liam Cosgrave has died at the age of 97. Born in 1920, Mr Cosgrave joined Fine Gael at 17 and studied law at University College Dublin. He was first elected to the Dáil in 1943 as a Fine Gael TD for Dublin County. He served as parliamentary secretary to taoiseach John A Costello, while he was also Minister for External Affairs from 1954 to 1957. Mr Cosgrave was elected party leader in 1965 and became Taoiseach on 14 March 1973, at the head of the Fine Gael/Labour National Coalition. His coalition government was in power until 1977, when Fianna Fáil won a landslide electoral victory. Mr Cosgrave resigned as party leader in the wake of that defeat, and he left the Dáil in 1981. The son of WT Cosgrave, who was head of the State's first government from 1922 to 1932, Liam Cosgrave's wife Vera died last year at the age of 90. Mr Cosgrave is survived by his three children, Mary, Liam Junior and Ciaran. His son Liam Junior served as a TD from 1981 to 1987. Mr Cosgrave's passing was announced in the Dáil this evening by Leas Ceann Comhairle Pat 'The Cope' Gallagher. Taoiseach Leo Varadkar expressed his sympathies to Mr Cosgrave's family and friends. He said he was someone who devoted his life to public service and a "grateful country thanks and honours him for always putting the nation first". President Michael D Higgins said Mr Cosgrave was committed to serving the people of Ireland "with all of his energy, intellect as well as passion." President Higgins said he will be remembered as a taoiseach "with the capacity to win and secure the stability of a multi-part coalition."